I recently received an invitation to check out some behind-the-scenes Rogue One: A Star Wars Story videos and watch cartoon images of Star Wars X-Wings fly through the streets of Chicago. There was only one catch: the experience was available exclusively on my Uber app and viewable only after I had requested an Uber ride. I believe the Rogue One content points to a new future for Uber: one in which the app serves as a content-sharing platform for brands, like a Snapchat on wheels. Soon, musicians will launch new song videos on Uber before anyone else can see them. When Wes Anderson creates another slick short-form holiday film, Uber riders will see it first. Get ready for Uber to become a hot media brand. Uber has been blurring the lines between ride sharing and entertainment for some time. In July, Uber hosted a secret concert with musician Wale, and the only way to attend was to unlock the location through Uber. In September, Uber introduced Rider Music, through which riders can tap into their own Pandora and Spotify playlists through Uber — in essence, taking their favorite curated music with them while they’re getting an Uber ride. Rogue One marks a first: branded entertainment content embedded in the app. And there’s no reason why Uber needs to limit itself with entertainment experiences. In fact, Uber already offers branded content through relationships with other businesses, just not in the slick, in-app way that Disney does with Rogue One. 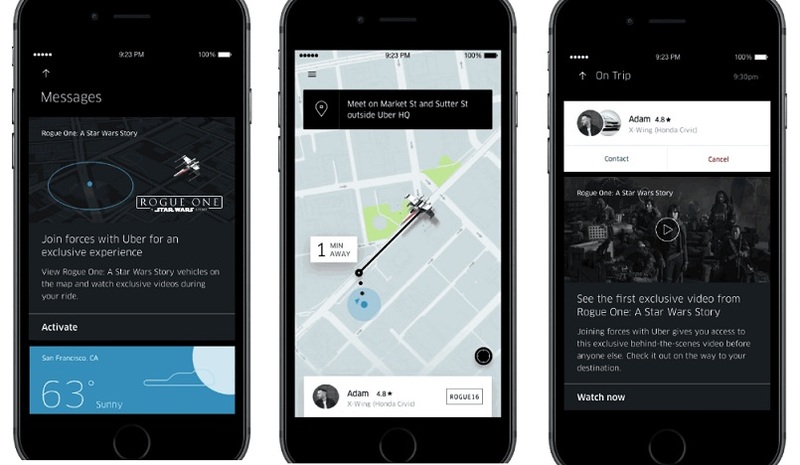 In January, Uber launched “Trip Experiences,” which relies on integrations with third-party apps to make it possible for brands to serve up content ranging from restaurant reviews to news. It’s taken some time, but businesses are figuring out how to take advantage of the functionality. The Washington Post recently launched an integrated viewing experience through which readers can browse content on The Washington Post app while checking the status of their Uber ride. Moreover, Uber recently announced that users could order Uber rides off the websites of nearby businesses and receive branded content from those businesses en route. Cole Haan and Guitar Center have already beta tested the functionality. Uber is sitting on a treasure trove of data about the 50 million people who have taken 2 billion Uber rides, including who they are, where they are going, and what they’re doing. (Uber has received criticism over its use of customer data, too.) The company can offer advertisers very targeted opportunities to reach segments such as millennials. And Uber regularly puts its customer insight data to use, forming partnerships with brands such as Starwood that want access to Uber’s customers to provide offers such loyalty program points for customers that use Uber. Uber could use from the revenue the app could gain by forming relationships with brands. The company lost a reported $1.2 billion in the first half of 2016, with a failed expansion into China proving to be especially costly. The company is eager to show that it can monetize effectively in advance of an expected IPO. By its nature, Uber is a utility that people have to open in order to use. The downtime that users experience during Uber rides is a natural moment for brands to share content to keep users engaged with Uber so long as the content is engaging. Picture those annoying screens that play in the back of taxicabs (if you still take taxicabs anymore) only with content that is more interesting and useful — because Uber is consistently an interesting and useful brand. Rogue One, for instance, is not a randomly curated piece of content. 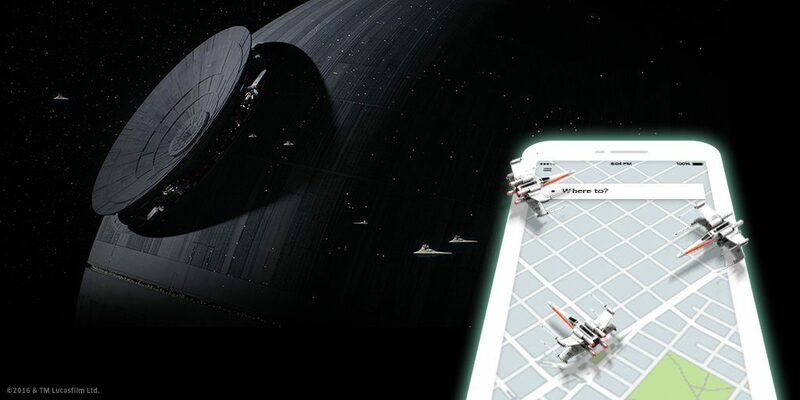 Uber has timed the sharing of the behind-the-scenes video plus the playful in-app Star Wars space craft experience during the run-up to the official opening of Rogue One to capitalize on a time when users are going to be more naturally interested in viewing the content. The Rogue One/Uber experience is all about relevance. Uber also consistently demonstrates a willingness to adapt its business. As I’ve contended on my blog, Uber’s core business is disruption, not ride sharing. Uber has entered markets ranging from food delivery to healthcare by wedding technology with a keen understanding of consumer behavior, by the creation of partnerships with other brands, and by consistently trying new models. Uber tests, learns, and corrects its model quickly. Right now making a content push is Uber’s latest test-and-learn initiative. Businesses can play in a number of fascinating ways. In addition to serving up exclusive content, brands could provide broader experiences that span the online and offline worlds. The next musician who offers a secret concert via an Uber relationship could also provide exclusive music through Uber while fans ride to the concert. Imagine a hotel offering rides to its guests via Uber and providing exclusive in-app games for riders en route to their destination. Uber is a palette for content. Businesses just need to figure out the right kind of branded content that engages riders. Rogue One offers a glimpse of how that content will look. This entry was posted in Design, Entertainment, Marketing and tagged David Deal, Rogue One, Snapchat, Superhype, Trip Experiences, Uber. Bookmark the permalink.